Astrobiologist David Grinspoon examines Earth and humanity's role in shaping it in a new book, "Earth in Human Hands" (Grand Central Publishing, 2016). Space.com talked with Grinspoon about what it means to be intelligent on a planetary scale, whether humans have a responsibility to modify Earth in particular ways, as well as what it all might mean in the hunt for advanced civilizations. Space.com: One of the things your book did was redefine the notion of intelligence. Under your new definition, humans have not yet attained that intelligence, right? We have all this very clever technology and all these abilities to manipulate the world in all these ways, yet we are faced with the very real question of whether we can be sustainable on this planet, whether or not in fact we can endure. That, to me, raises an obvious question. Space.com: So, intelligence can be considered on a planetary scale? Especially then going back to the SETI [search for extraterrestrial intelligence] question, because longevity is so important in the logic and the math of SETI. There may be a bifurcation or subshell [of life] that don't make this leap to this type of intelligence. The ones that do make that leap have a very long lifetime. And they're the ones that in my view are intelligent. Using your knowledge of the universe to prolong your lifetime seems like an obviously reasonable criterion [of intelligence]. If you use that criteria, then it's not obvious that we have intelligence on Earth yet, but we can certainly glimpse it. Space.com: You also wrote that sustainable alien populations could be harder to detect. What would that mean? Grinspoon: One possible answer to the Fermi Paradox, which asks "Where are they?" is that they're all over the place, but they're not obviously detectable in ways that we imagine they would be. Truly intelligent life may not be wasteful and profligate and highly physical. Arthur C. Clarke said that the best technology would be indistinguishable from magic. What if really highly advanced technology is indistinguishable from nature? Or is hard to distinguish. There's the set of assumptions embedded in [the search for extraterrestrial intelligence] that the more advanced a civilization is the more energy they'll use, the more they'll expand. It's funny to think about that and realize that we're talking about this while realizing things about our own future, that there is no future in this thoughtless, cancerous expansion of material energy use. That's a dead end. So why would an advanced civilization value that? You can understand why a primitive organization would value that — there's a biological imperative that makes sense for Darwinian purposes for us to multiply as much as possible, that's how you avoid becoming extinct. But in a finite container, that's a trap. I assume that truly intelligent species would not be bound by that primitive biological imperative. Maybe intelligent life actually questions its value and realizes that quality is more important than quantity. I'm not claiming to know that this is true about advanced aliens because I don't think anybody can know anything about advanced aliens, but I think it's an interesting possibility. That could be why the universe isn't full of obviously advanced civilizations: there's something in their nature that makes them not obvious. "Earth in Human Hands" author David Grinspoon poses in a Mars Pathfinder display. Grinspoon is a co-investigator for the Mars Science Laboratory's Radiation Assessment Detector. Space: Is there any way that we would be able to detect a civilization like that, other than them directly contacting us? Grinspoon: Yes. I think that an advanced planetary civilization will modify their own planets to be more stable, to prevent asteroid impacts and dangerous climate fluctuations. I think we can look for engineered planets. I think that if we're around in 10 or 20,000 or 100,000 years, we will be engineering Earth. I think that when society gets planet-changing technology, it will either not last long because it can't handle that, or it will become able to manage themselves and their planet. Truly advanced civilizations, their planets will potentially be recognizable as planets that have been altered purposefully. We could start looking for technosignatures. What would a managed planet look like? Again, I don't know exactly; I don't completely anticipate what super-advanced aliens would do. As we start this new age of studying exoplanets to see what they're actually like — which is just around the corner — I think we should keep our eye open for technosignatures [while we hunt for biosignatures]. Space.com: That goes back to geoengineering. I love that you count asteroid deflection and planetary protection as part of geoengineering; it's not something I've really considered. It's also interesting that you describe us as already geoengineering the planet negatively. Grinspoon: And positively. When we do reforestation, fix the ozone, these are kinds of geoengineering. Even when we have the Paris Climate Agreement and decide we're going to reduce our emissions collectively, we are going to shoot for that target, that's a kind of geoengineering. I think people react negatively to the idea of geoengineering because they associate it with some of these very intrusive, brute force methods, like squirting a bunch of stuff into the stratosphere and trying to dim the sun. I agree with that sort of horror; I don't think we know enough to do [a] clumsy, brute force intervention. I'm not in favor of that. But what I am in favor of is us realizing that we are planet changers. We can't really relinquish that. Therefore, we have to learn how to do it well, gracefully and knowledgeably. There's a wide range of activities that are going into categories of what I call "planetary change of the fourth kind," that are intentional, and some of them are obviously very benign, like reforestation. Some are scientific [and] futuristic but ultimately necessary, like asteroid deflection or preventing the next ice age or extinction event. [When it comes to drastic measures to reduce carbon emissions' impact, however,] there's no easy quick fix. I'm in favor of thinking about geoengineering in the long run, but I urge caution about quick fixes. Space.com: You also wrote that down the road, once we've got everything stable, we could dull the edges of the climate cycle so we don't have back-and-forth swings. How would that work? Grinspoon: We definitely don't want to go through another ice age or another natural cycle of global warning. Both happen over a long period of time. It would be disastrous for our civilization, and not just for us but many other species. If we're worrying about the mass extinction that we're causing … then I don't think we want to passively watch something happen to Earth at this point that causes a mass extinction. If we have the ability to intervene, it seems like our responsibility to intervene. So it's not just for us; it's for the biosphere. Space: But isn't it possible that Earth needs to go through these cycles? Grinspoon: Yeah, it's a tricky one. I think you have to be careful of making that argument, because then you say that [human-caused mass extinction] will be good in the long run. It does raise some very interesting ethical questions. The one that I wrestle with, that I don't know the answer to, is suppose you're effective in the immediate and urgent task of ceasing the mass extinction that we are in danger of now. We've not yet caused mass extinction, but we're on track to if we don't modify what we're doing. Suppose we do what we need to do, so we're no longer threatening lots of species, we've cut back on habitat loss, agriculture, all these things, we sort of stabilized our influence. Then what is the rate of extinction we desire? What is the right rate of extinction? Do you want to reduce it to zero? If we do that, that's a massive intervention in the natural history of the Earth, to stop this process that's been part of billions of years. But we don't do that we're basically saying you don't get to survive. Space.com: In the book, you mention the issue of eradicating smallpox. So clearly we as humans think there are some things that we should make extinct, right? Grinspoon: I'll have no problem with extincting smallpox. But once we've admitted that about one species, we open the door. What about mosquitoes? They're annoying but some birds eat them. Trust me, I'm not really not fond of mosquitoes. Space.com: You point out that Earth's climate cycle has influenced human evolution. If we mute it, could we be unknowingly robbing other species of advancing their evolution? Grinspoon: Absolutely. I think we have no choice but to intervene with the Earth now because we're sort of inadvertently influencing it and we have to get a handle on that. But getting a handle on that is an intervention itself. And once we are intervening with the Earth it raises all these really difficult questions. We are controlling the future of evolution, and so we're either going to do it in a mindful or a mindless way. Yes, we are affecting and preventing the evolution of species that would otherwise come into being without us, absolutely, but in a certain sense we've been doing that for a long time. Once we admit that we are in control, it raises all kinds of difficult questions. There's one I already raised about the right rate of extinction. There's also, what's the right temperature to set the [Earth's] thermostat at? Here's another one: What's the right human population of Earth? Space.com: You also refer to a theory, Gaia, that considers life as a fundamental part of Earth and Earth overall as a living organism. How does that fit in? Grinspoon: What I try to do [in my book] is put the human effects on the planet in context of the long-term history of the planet. For that purpose, it was useful for me to talk about these different branching points, where there was an origin of life and then there was a takeover by life, and life becoming a planetary property. That's really what [the concept of] Gaia is about. It's not just that the Earth is alive. It's looking at how life is so deeply embedded in the cycle of the planet that there's that sense you cannot fully separate the living from the nonliving parts of Earth. Earth's life became a sustained part of the function of the planet. Venus and Mars might have an origin of life but they did not have a Gaia. And now I see that we're at a breaking point, where we have technological intelligence that may or may not become a sustained integrated part of the function of the planet. It's a deep integration of cognitive life into the function of the planet in a sustained way. Can that happen here, and can it happen anywhere? That's the analogy I'm interested in. This interview was edited for length. 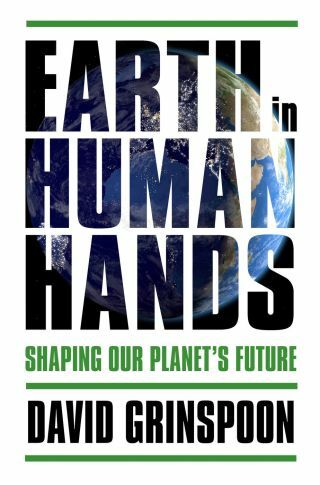 You can buy "Earth in Human Hands" on Amazon.com.